Sadly, the device does not also shoot shurikens. The cruel reality of military technology is that we may never have the type of energy weaponry we see in fiction - no Star Wars blasters, no Gundam beam rifles, and no Halo plasma rifles. Instead, energy weapons are more subtle or practical, like focusing heat to blind sensors or rupture armored plating. In less subtle or practical matters, however, US Army scientists have figured out how to fry targets with guided lightning. 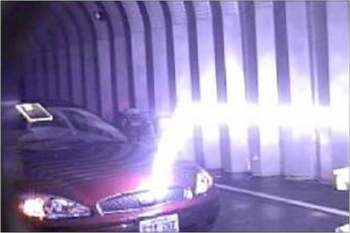 Researchers at the Picatinny Arsenal in New Jersey have developed a method to control one of the most impressive of all meteorological phenomena: the thunderbolt. Lightning, as with all electrical charges, naturally travels from the clouds to the earth taking the path of least resistance. The trick, then, involves creating the least-resistant path possible - and that's done with lasers. "If a laser puts out a pulse with modest energy, but the time is incredibly tiny, the power can be huge," said project lead George Fisher. The laser pulse in question comes from an optical amplifier with an output of 50 billion watts - enough to power a large city - but it only lasts for two trillionths of a second. The air surrounding the pulse acts "like a lens," keeping the pulse focused like a lightbulb filament. The electromagnetic field of the super-intense pulse tears electrons from the air molecules, creating a channel of plasma along the laser's path that can be directed by aiming a mirror. That ionized air, then, becomes the path of least resistance for an electrical pulse - so if a high-voltage source is nearby, it will follow the channel exactly to its target. Zap. While the ability to shoot lightning down a laser is just kind of awesome in itself, it could be used to destroy enemy armored vehicles or detonate stockpiles of unexploded ordnance, says Fisher. "We never got tired of the lightning bolts zapping our simulated [targets]." There are still many, many issues to work out with the technology before this could ever potentially see use on the battlefield. The laser and voltage source must be synchronized, the device must withstand the wear and tear of operational military use, and you don't just get 50 billion watts of energy from a few AA batteries. But it's still a contraption that shoots lightning at people.